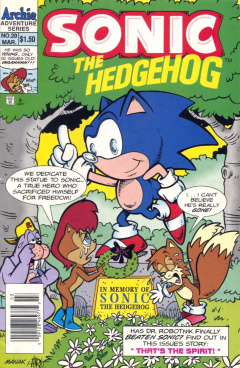 Sonic the Hedgehog 20 is the twentieth issue of the Sonic the Hedgehog comic series. It was released in March 1995. This comic features two stories: That's the Spirit! and Deadliest of the Species. Sonic the Hedgehog and Sally Acorn are infiltrating Robotropolis, to seek and destroy Dr. Robotnik's anti-matter machine. Swinging over a group of Swatbots undetected, Sonic jokes about the situation, saying they have time to chat, making Sally nervous. With the anti-matter machine, Robotnik can make himself and his Swatbots invisible and unstoppable. While running through a corridor, NICOLE beeps. The two stop as Sally takes NICOLE out, notifying Sally that it is detecting anti-matter emissions. They arrive at a room with a large machine functioning, which Sonic jokes about, saying it could be Robotnik's food processor. They look around and realize there are no guards, therefore Sonic decides to go ahead and destroy the machine. He runs into the room, despite Sally's objections that it could be a trap. As he arrives at the machine, surely enough, Sally is right, and the doors to the room close. Sally tries kicking the door, to no effect, while Sonic realizes that Sally was right. He walks up to the door to see if Sally can hear him, but the door turns into a monitor, showing Robotnik as Swatbots arrive. He notifies Sonic that the machine was just a lure to catch him, although he was unable to get his anti-matter machine working. As the Swatbots prepare to make the jump for Sonic, he decides to take out Rotor's bomb and do a quick spindash through the door to escape the explosion. He throws the explosive toward the machine and prepares to head for the door. He trips over a wire, causing him to drop just as the explosive goes off. Hours later, in the Great Forest, an injured and visibly shaken Sally crawls to the other Freedom Fighters. She explains about the explosion, and how she barely got out, as Bunnie Rabbot goes over to help her. She then tells the group that Sonic was caught in the explosion, sacrificing himself for the good of the Freedom Fighters. As the group mourn, Tails is still pessimistic, thinking he must be alive as he is the greatest, but Antoine tries to explain to him that he is truly dead. Back in Robotropolis, the room with the anti-matter machine is completely destroyed. Despite all the odds, from the middle of the debris, Sonic stands up, alive and well, joking about the situation, but lacking any color. Still joking about his triumph, a steel door falls right over him, but doesn't affect him. He jumps aside, confused, only to realize that he can't see himself and that the steel door went right through him. Concerned, he decides to head back to Knothole. He arrives back at Knothole, to see the Freedom Fighters working on something under a large tarp. He stops as he looks on, Sally delivering a eulogy with the others mourning. As she finishes the eulogy, Bunnie raises the tarp, revealing a crudely-made Sonic statue. Sally blames Rotor, but Rotor blames Tails for not taking the job of making the statue. He detests, stating he still thinks Sonic is alive. Sonic tries to get the attention of everybody, but nobody can seem to hear him as they continue to argue. Sonic goes up to grab Sally, but his arm goes right through her. He starts crying, realizing he's a ghost and that he can't communicate with them. Realizing he can't be with the others, he heads out into the Great Forest to live alone. On the good side, he realizes he doesn't have to fight Robotnik, eat, or wearing a Halloween costume. Nonetheless, he still finds it uncool and kicks a rock. Oddly, the kick is a success, as it flies in the air and gives Sonic great pain in his foot. While hopping around in pain, a frog nearby hears him and jumps into a pond. Sonic looks over, realizing that he felt pain and that the frog heard him. He then realizes that the explosion of the anti-matter machine must've made him invisible, and that the effects are slowly wearing away. To test his theory, he hops on a moose, and it works, as it freaks out and runs away. Sonic hops off, realizing he is solid and can be heard, but still not seen. With this good news, Sonic heads back to Knothole. As he arrives, he finds a note pinned on a tree trunk from Tails, who still believes Sonic is alive. The note states that the Freedom Fighters have gone to Robotropolis to avenge his death. With Sonic dead, Robotnik begins to celebrate, hoping around his lair in joy. With Sonic out of the way, he can begin his full invasion of Mobius, without hesitation. His nephew, Snively, breaks his parade, stating that there are still the rest of the Freedom Fighters to contend with. Robotnik grabs Snively in anger at such a statement, but Snively quickly corrects himself, saying they think they can defeat him, but they can't. He points at Robotnik's monitor to show that the Freedom Fighters were, indeed, on their way. He orders Snively to get his Buzzard Bot ready, anticipating victory already. Outside Robotropolis, the Freedom Fighters, in infiltration garb, go over their plan: to locate Robotnik and force him to surrender. However, they have no need to locate Robotnik themselves, as Antoine points at Robotnik arriving at their location in a large bird-like vehicle. With the Freedom Fighters in sight, he orders Snively to descend and grab them for Roboticization. From behind the cockpit, the invisible Sonic arrives, grabbing the controls from a confused Robotnik. He sends the Buzzard Bot away from the Freedom Fighters, introducing himself as the ghost of Sonic. Robotnik doesn't believe in ghosts, but when Sonic sends the vehicle into a nose dive, he gives in. He orders Robotnik to free Mobius, exercise, and to get a hairpiece, then opening up a door and ordering him to leave. He pushes Snively out of the way in fear, grabs a parachute, and prepares to jump out, but not before Snively is able to as well. Just as they leave the vehicle, Sonic becomes fully visible, so he decides to ditch it. From aside, the Freedom Fighters watch in confusion as Robotnik and Snively bail from the Buzzard Bot. Tails exclaims that Sonic did it, but Sally tries to convince him it couldn't have been. Right at that second, a fully visible Sonic arrives. He tells the group about what happened, realizing that Robotnik still thinks he's a ghost. Sally thinks of an idea to take advantage of that. Back in Robotropolis, Snively watches on the monitor as Sonic is, indeed, alive. He runs to tell Robotnik the news, but realizes he best keep it to himself, as he witnesses a mentally tormented Robotnik running on a treadmill with an Elvis-style hairpiece. A prologue to the Princess Sally miniseries. Infiltrating a Robotropolis energy sub-station, Sally swims to a dock with a rubber ducky head disguise. At the top of the dock, she takes off her swimming gear and proceeds on. She arrives at a tall wall, so she takes out her grappling hook. She looks down and sees a Swatbot. She jumps down on it and shocks it with a defibrillator. She jumps off of it as it crashes down and continues on to a locked panel at the sub-station. Taking out NICOLE, it unlocks the panel, and climbs in, arriving in a dark room. She turns on a light, and goes over to a computer panel, letting NICOLE take over. It accesses the system and activates an auto-destruct system. With 23 seconds to spare, she escapes the building and escapes, while trying to keep her cover. At 15 seconds left, she hears a thump around a corner of a building, so she takes out a grenade. Turning the corner slowly, she looks on as a crossbow is being pointed at her, being held by a male skunk. She asks who she is, but he refuses to answer the question, instead asking who she is or he'll knock her out. With the countdown almost done, she tries to explain that they have to get out before the sub-station explodes. Before she can explain, the auto-destruct goes off, propelling the two away from the area. They both get up, as the skunk realizes that she did his job for him. Realizing he is an enemy of Robotnik, she introduces herself. The skunk recognizes Sally's name and stands up quickly, saluting, introducing himself as Geoffrey St. John, a member of the late His Majesty's Secret Service and a member of the Rebel Underground. Sally, however, has never heard of such a group, and is curious about what other secrets he has under his sleeve. Unknown to her, a Swatbot has gotten up from the explosion nearby and has her in its target-sight. Continued in Princess Sally #1. The old title page of Princess Sally #1 shown in Sonic-Grams. Geoffrey St. John is introduced. A coloring page is featured in this issue. The intro header to Deadliest of the Species with Sally in the sight of a gun barrel references the gun barrel introductions in the James Bond series of movies. The Sonic-Grams of this issue introduces the cover art to Princess Sally #1. This cover art would be remade and reintroduced in Sonic the Hedgehog 21's Sonic-Grams.